Our schools and education of our kids are important to me. As such, below are some of my blog posts that focus in these areas. In 2016, I ran for the HSE School Board. Below is information I had posted regarding my candidacy. 2016 was my first time running for a public political position. As such, it was a learning experience. Thanks for taking the time to come to my personal HSE page. Friends, family, teachers, and several others suggested that I run for the HSE Board in 2016 based on my interest and passion for what is happening in our schools. While had been engaging with the board as a parent, in the end, I agreed that being on the board would have a bigger, needed impact. 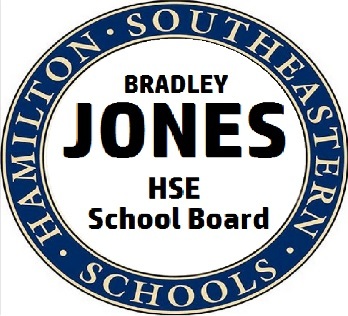 Therefore I had my name put on the ballot for the Hamilton Southeastern (HSE) School Board. Below is the information I had posted here on my web site regarding my candidacy. This information is now dated; however, should I consider a future election, the information is still relevant. Note: This is a long page. For a list of tidbits about me, and of core issues, scroll down. A board position is a four year commitment, so it is one I did not taking lightly. Unlike those that I’m running against, I didn’t just start attending board meetings. The candidacy didn’t lead me to getting involved with the school board, rather my involvement as a parent attending board meetings led me to be a candidate. Those that know me are aware that I care about doing what is best for our kids – all of our kids. While the School Board doesn’t work with our kids directly, they do set the rules, policies, and procedures for those that do. As a member of the board, I would work with the board to make sure our rules and policies give our kids every chance to get the best education and experiences so that they can be best prepared to succeed in life. I also commit to being fiscally responsibility. With changes in state funding, increased referendum dollars, multiple school bonds passing, and city TIFs, it is important that the board stay tuned into how money is being obtained as well as being spent. The city of Fishers projects a 2% growth in population over each year during the next decade with a more than 50% growth by 2040. As Fishers and the surrounding areas grow, so will our schools*. Decisions for this growth need to be made now if we want to maintain smaller class sizes and have the teachers and resources to continue delivering among the highest-quality education. One of the big issues for the school board to resolve is the conflict of their own demographic study as compared to that of the city. Technology oversight is a topic that has been raised very loudly by many members of our community. As we continue the integration of technology as a tool within our schools, it is important that the policies and procedures approved by the HSE school board evolve with the changes.Topics like screen time, network security, technology failures, and age appropriate technology come up in nearly every discussion, so they are topics to be taken seriously. Another key area of concern is teacher retention. We need to continue to hire great teachers, and then we need to make sure we keep them. Salaries and benefits are only one element in building an environment that draws and keeps good teachers. We need to make sure we are creating and maintaining an environment where our teachers can focus on teaching without unnecessary distractions or lack of support and training. There are a variety of other topics that are equally important that range from discrimination issues, mental health awareness/help, class sizes, professional training, school fees, retention of the academic programs, alternative career options, and so much more. These topics are equally important. On some of these, there are initiatives already happening. On others, more needs to be done. The reality is, we have great schools and live in a great district. I was one of the only candidates running in for HSE that attended a meeting by the Indiana State Board Association (ISBA) for candidates. This allowed me to meet a number of candidates running for school boards in other districts around Indiana. It was very clear that HSE is at the top of their game in educating kids. We have areas we can improve, but overall the performance of our schools outshine most schools in Indiana as well as around the country. Even so, we have a number of areas where we have to do better. Stay tuned to my blog to hear some of my thoughts, concerns, and perspectives on school, community, and tech topics. Regardless of how the campaign goes, I’m sure that in the coming months I’ll be addressing my thoughts on a number of initiatives that are already underway in the school system ranging from balanced calendars to world languages with tons of topics in-between! Just as I was writing on these topics before August, I’ll continue to write on them after November 8th. In the meantime, below is a summary of information I’ve put into a handout that you can download from here. The information was created to fit on a single, two-sided piece of paper that I’ll be handing out, thus it is relatively sparse. If you live within the HSE district, please feel free to download the document and share it with your neighbors.